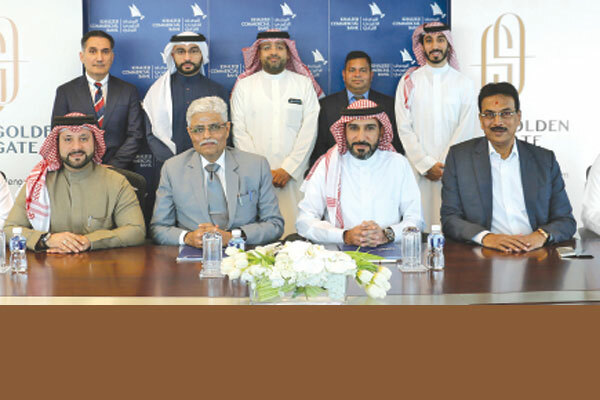 Golden Gate Developers, a joint venture between Kooheji Golden Gate and Indian real estate groups Ajmera and Mayfair Housing, has signed a deal with Khaleeji Commercial Bank to offer escrow account services to investors in its premium Bahrain project. A first-of-its-kind real estate project in Bahrain, Golden Gate, which aims to become the tallest residential towers in Bahrain, will consist of two towers with 45 and 53 storeys and a total of 746 apartments, as well as luxurious amenities, facilities and services that are unparalleled, said the developer. These apartments are available for a starting price of BD45,000 ($118,669), it stated. The property will come up over a 140,000-sq-m area, offering residents remarkable views of the waterfront and top Bahraini landmarks in the area. With state-of-the-art gyms and spas, a home theatre, business centre and a concierge service to tend to people’s every need, Golden Gate has a customer-centric focus, providing its residents with a unique experience of modern living, said the developer. Through this agreement, Golden Gate Developers will open escrow accounts for investors to help regulate the relations and service agreements with property owners that meet the global advanced practices in real estate development, it added. Kooheji Group chairman Ishaq Al Kooheji said: "We are proud to partner in offering escrow services to our investors, in line with the new law that aims to protect property owners’ rights and assist in minimizing any associated risk in full compliance with the laws of Bahrain, CBB, the Real Estate Development Corporation and all regulatory authorities." "We are keen to support national efforts to propel Bahrain into the spotlight, making the kingdom an exemplar of excellence in the real estate industry.” remarked Mr. Kooheji after signing the deal," he stated. Ajmera Realty managing director Manoj Ajmera said: "The escrow service will attract more Indian investors to Bahrain, along with Bahraini and GCC investors. Golden Gate project is the “jewel of the crown” for our group, which has accumulated over 100 years of experience in the real estate sector and a project portfolio of 40 million sq ft of commercial and residential space in India." Lauding the agreement, Sattam Sulaiman Algosaibi, the chief executive of KHCB, said the bank was keen to support the growth of real estate projects in Bahrain and to provide the appropriate financing for those wishing to own their residential units.